So I totally love valentine’s day but I’m also a believer in showing the people you love that you love them everyday! 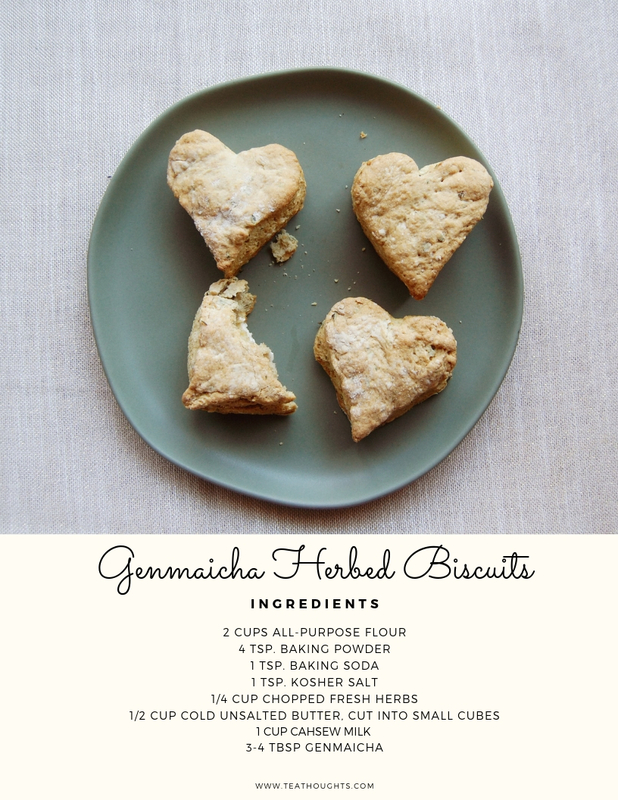 What better way than with some delicious herb biscuits infused with genmaicha that are heart shaped! Feel free to use whatever herbs you’d like but I used rosemary, thyme, dill and some garlic. I chopped them all together using a food processor! I found that folding the dough is really important to get a tall and flaky biscuit! These biscuits are so cute, buttery and the herbs add an incredible taste! Heat up the milk and when it starts to bubble, take it off the stove and mix in the genmaicha tea and let it sit for a minute then strain and set the milk aside for use later in the recipe. Mix together the dry ingredients and the fresh herbs mixture! Make sure the butter is cold and cut into cubes. Cut the butter into the flour mixture with a pastry cutter, 2 knives or even your hands! You want the butter and the flour to resemble crumbs but make sure than not ALL the butter is totally mixed in! Add in the milk and stir to combine then take the dough and put it on a floured surface. You want to take the dough and fold it half then smooth our a bit. Do that a few times and this will give the biscuits some volume! Don’t roll out the dough, pat it down and then take a heart shaped cookie cutter and cut out your shapes. Use some parchment paper on a baking sheet and cook the biscuits for 12 to 15 minutes or until golden brown! These are really good with butter or probably with any other savory topping! I personally could have used a bit more salt in these biscuits so I suggest enjoying with salted butter or irish butter! Fall is here and I always crave squash and eggplant! I try my best to go to the local farmer’s market every weekend or every other weekend to support Maryland Farmers! I happened to pick up 3 nubia eggplants! My original plan was to make khoresh bademjan which is an Iranian eggplant stew but when I got my Sipsby box and saw that there was genmaicha in it, an idea started brewing! Genmaicha is a Japanes green tea that also had puffed rice in it. This genmaicha is from Yannoko tea and is their organic variation which includes bancha as the green tea. I love rice so the very first time I tried gemaicha I was in love! Genmaicha is definitely a tea that pairs well with savory food as it has the grassy green tea flavor as well as some roasted notes due to the rice. I decided to try a sauce using genmaicha to top the eggplants with! In my recipe you’ll see that I said to let the eggplants “sweat".” When we prepare eggplants for the khoresh I mentioned above, you peel and slice the eggplants then salt them. After a little bit, you’ll see beads of liquid on them hence the “sweat"! This helps rid the eggplants of some of the bitterness. You are welcomed to fry the eggplants instead of baking but I love to bake them. With a little olive oil, S + P, they get browned and a bit crispy on the edges! The baking time really depends on your preference and also how thick you sliced your eggplants. I wanted to give a little advice when slicing. Sometimes slicing thin can help things cook quicker, but with eggplant in the oven I’ve noticed that if they are sliced too thin you really lose most of the eggplant. When doing this sauce I think it’s best to have all your ingredients prepared before you start so that you can focus on the sauce itself. When you brew the genmaicha tea, make sure to follow brewing instructions on the package. For reference, brewing temperature is 176F and steep for 30-60 seconds. You can do multiple infusions. One other brewing note is about strength. In my other recipes I sometimes brew the tea on the longer side so that it is more potent in the dish since many times it is being cooked. Be cautious of applying that to genmaicha. I find genmaicha to be pretty delicate and you wouldn’t want the tea to be bitter and then transfer that taste to your meal! The genmaicha helps cook the spinacha bit more and once it’s reduced use as much boursin as you’d like to thicken it. I could definitely use more cheese but was trying to keep this a semi helathy recipe :D I did want to note that I used boursin because I had some, it’s creamy texture and the fact that it is already flavored with garlic and herb which I think went well with everything else. You could definitely experiment with other cheeses but be careful of using one that is too strong as it will likely overpower any notes of the genmaicha. I thought this sauce turned out well and it paired well with the eggplant! The sauce definitely has an earthy taste which is thanks to the genmaicha! A fancy but easy meal for a day when you have time to make yourself a nice meal or use at a party! Pumpkin + tea pasta whaaaaaattt? I found a package of pumpkin pasta at marshalls and HAD to make a recipe with it! I’ve already made pesto with tulsi tea before and wanted to try something else! I also try to use up whatever I have in my house at the moment and I pulled out some eggplant from the farmer’s market. Eggplant is prominent in stews in Iranian cuisine and stews remind me of fall and winter so I thought it was the perfect addition to the sauce/topping I was making. I was sent the golden tips tea from Upton Tea to try and make a recipe with! The golden tips tea is a black tea but it has such a lovely, sweet and light taste to it that I thought it could go well in the sauce/topping! One tip I have for prepping the eggplants, salt them! When we prepare eggplants for the stews I mentioned earlier, we peel them and salt them. When they “sweat” it helps get some of the bitterness out of them! Feel free to mess around with proportions of tea but this is what worked for me to be able to get it to reduce and become thicker! It's been a long time since I've made a recipe with matcha and this one popped into my head the other day. I have been making this garlic jasmine rice ever since I got the recipe in a blue apron box. The water that is added to the pot is a perfect opportunity to add a type of tea! I've used matcha in cocktails and sweets so I've been curious how it would taste in a savory dish! With the earthy flavor matcha has, I figured it's a great flavor to add to a meal. I essentially keep the jasmine rice recipe the same but instead of using plain water, I use the same amount of brewed matcha. For this recipe I use Midori matcha from matchaeologist, this is a culinary matcha that is perfect for cooking! The matcha link is an affiliate link. Please consider purchasing with my link as it will help me keep this blog going! A few things differ about this recipe than the one I've linked below. I specifically use sesame oil because I think it goes well with the other flavors and spices up the recipe a bit. You are welcome to use any other type of oil that you think might taste good! In terms of the matcha, the amount is up to you. I used 3 tablespoons of matcha and that was plenty. The rice came out a beautiful green color and the flavor was not cooked away. 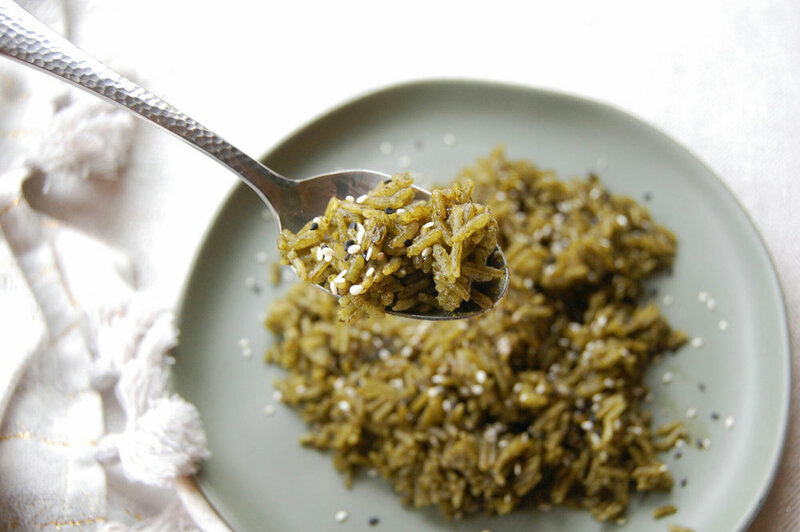 If you make more rice, feel free to add matcha and if you want to try this recipe but aren't a HUGE matcha lover I would suggest trying it with 1 or 2 tablespoons. Optionally, you can add tuxedo sesame seeds to the cooked rice for presentation but also because they are yummy! Depending on what you are pairing the rice with, you can also add soy sauce. I added soy sauce to try and liked the flavor combination. I think this rice can be eaten with almost anything but I feel as thought it would be most delicious paired with seafood! Depending on the pot that you use, the cooking time I listed can vary. Make sure after you cover the lid that you turn the heat low. If it's not low you will most likely burn the bottom of the rice! Another cooking note I wanted to mention was regarding the water/matcha. After about 14 minutes, I took the lid off and the rice seemed cooked but there was a little bit of matcha still on the top. Once I stirred the rice a bit in the pot, the matcha distributed itself around the rice. I'm not very good at hiding my pusheen obsession! 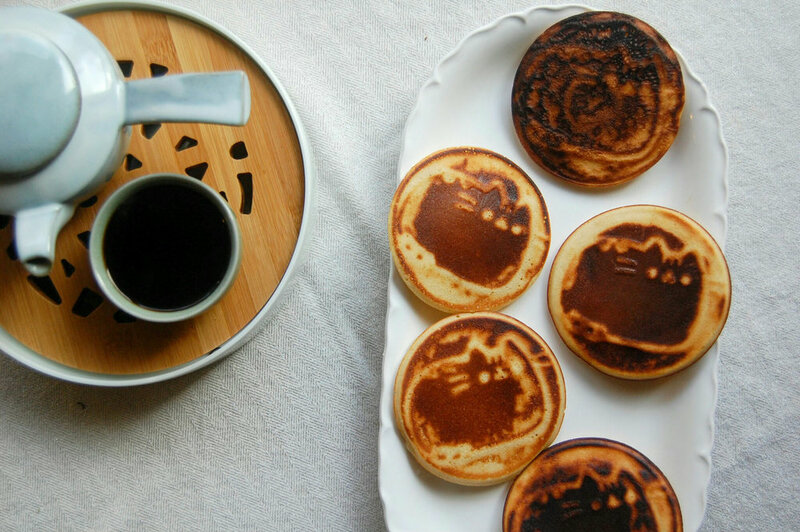 I love this cute little cat so you're probably not surprised that I'm subscribed to the pusheen box :D The fall box had this cute little pan in it so I decided to create a pancake recipe! 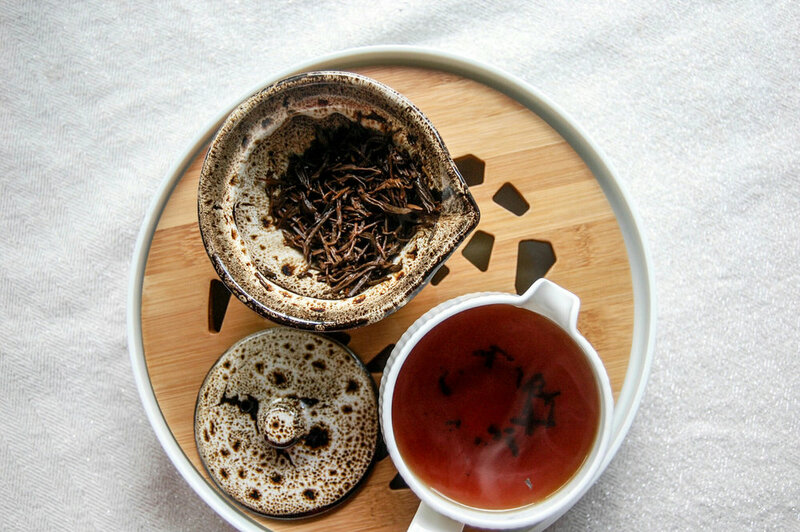 I got some "grandpa's puer" from White2tea in my sipsby box this month. 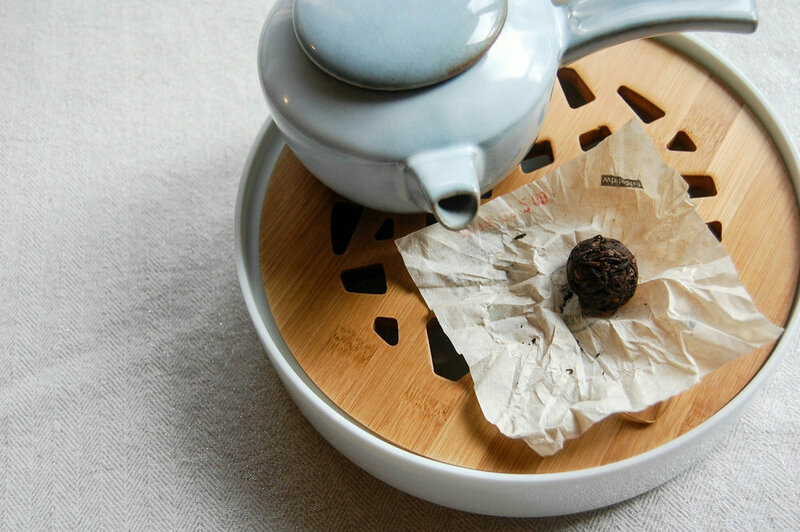 I've recently gotten really into puer and most of them have a really rich flavor which is great for recipes! This tea is named after "grandpa style" which apparently means not really paying much mind to brewing times. A more relaxed way of drinking tea. I can totally relate to grandpa style especially because when it comes to certain teas I like to judge them by color or aroma. This is a great recipe for a small batch of pancakes. The pusheen pan is pretty small so It made many pancakes but if you use a regular pan, the batter would probably make 1-3 pancakes! You could optionally swap out the milk and use 3/4 cup of tea in the recipe but I think that without any milk the pancakes wont be as fluffy! It was actually difficult to get a perfect mold of the pusheen pan but I did my best! I found it helpful to wipe out the pan after each pancake! Look how cute this pancake is! Topped with maple syrup, these tea infused pancakes are delicious! These turned out nice and fluffy too! I also added in some cinnamon into the batter to give them an incredible aroma! One of my favorite parts of starting Tea Thoughts is all the other amazing small business owners that I've encountered on my journey. Most of these people I've met through instagram, and have formed bonds with. My IG tribe. These are inspirational women who like me, were not satisfied and have gone out on their own to start a business and pursue their passions. Kristen from Tea For Three is a one woman show creating organic tea blends in the big apple! I recently purchased her Charlie Grey blend of black tea and bergamot essence, my fav combo! 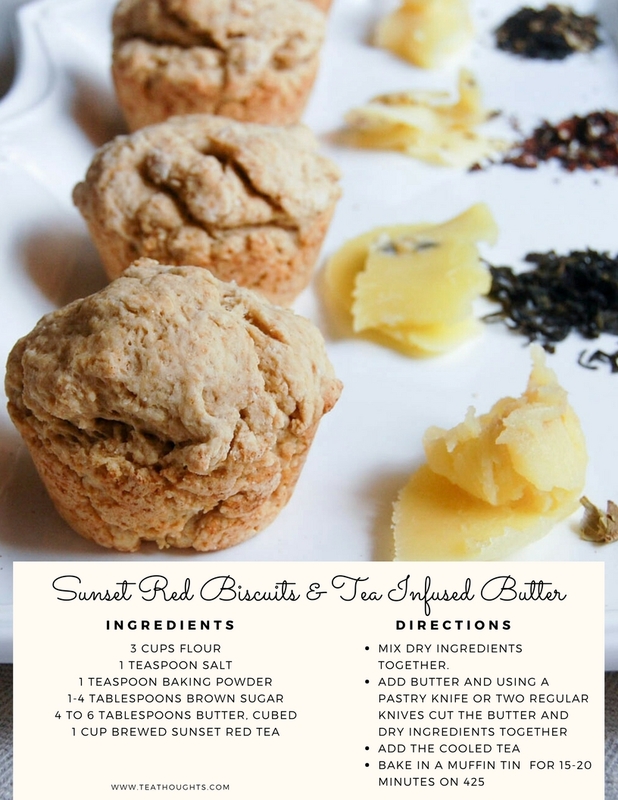 I decided to create some shortbread with this tea and make it more savory than sweet. I have a whoopie pie pan and thought it would be fun to use that to make sandwiches! If you don't have this pan, you can always use a round cookie cutter to get the same effect. The other way you can get this effect is by refrigerating your dough in a log shape and cutting off thin pieces. I don't include refrigeration in my recipe because I like it better when the cookies are a but crumbly but if a cookie that stays together better I highly suggest refrigerating the log for 20-30 minutes. The downside to baking them the way I did without refrigeration is that they are more fragile but I enjoy the crumbly nature of them. You can see in the photo below the spices in the recipe are present in the cookie. 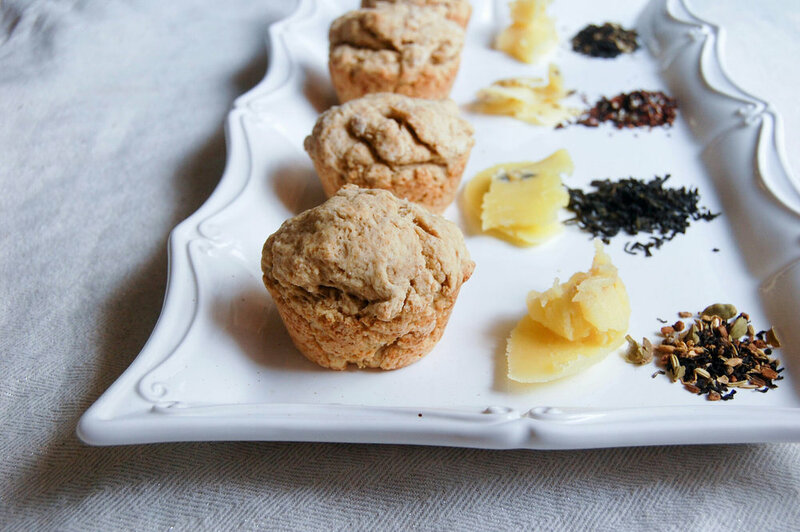 The nutmeg and clove give the cookies a more savory flavor, as opposed to a sweet cookie! I used two types of toppings for my sandwiches to see which went best with the flavor of the shortbread. I tried a jam and also a turkey and cheese combo. 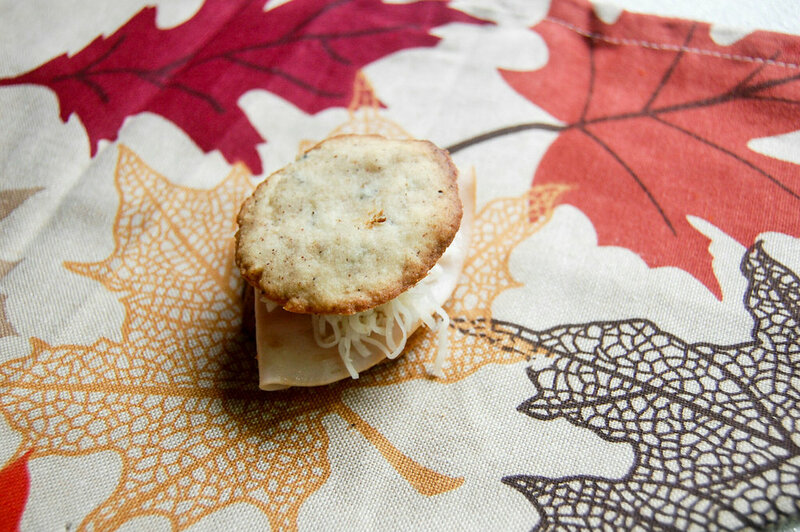 I thought that the savory taste of the sandwiches would mean that the turkey and cheese was better suited but I actually enjoyed the jam better on these! As sandwiches these are a bit messy once you bite into them but I enjoy a softer cookie to a tougher cookie! Now, if you try these and decide you like them but want a sweeter version, the transition is easy enough! You could simply add more honey into the batter. I would also suggest substituting the cloves and nutmeg for something a bit sweeter like cinnamon. 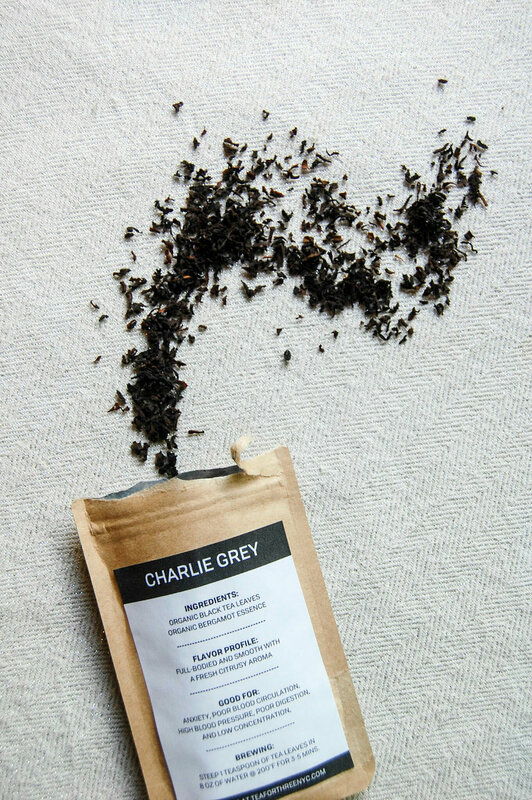 The charlie grey blend is versatile enough to go well with sweet or savory! The other day on my facebook, took recipe suggestions. One of the suggestions I received was hummus, but something more exciting than chickpeas and tahini. I started looking up hummus recipes to see how I could incorporate tea into a recipe. After lots of thinking I decided that although it wasn't my normal method of infusion, the only way I could incorporate tea into the hummus recipe was to soak the chickpeas! I received a Dark Roast Yaupon tea from Lost Pines Yaupon in my sipsby box and originally I wanted to make something sweet with it because the notes suggest this tea would be good with honey! After thinking over the types of recipes I've made recently I noticed that I hadn't made a "food" recipe recently. 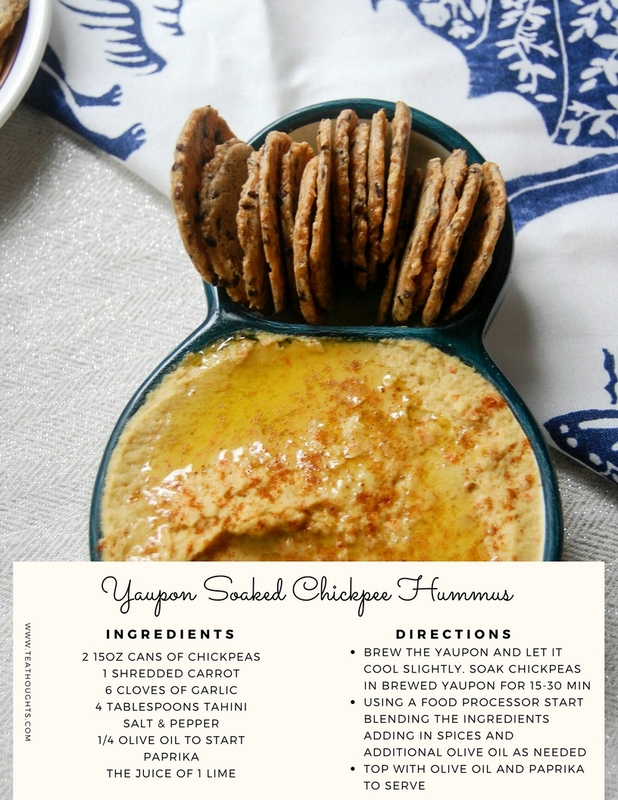 I decided the dark roast Yaupon would definitely give the chickpeas a roasted flavor that would go well with the other spices in the hummus! When I was deciding on my recipe I definitely tried to take into account ways that could spice up a normal hummus recipe. I rummaged through my fridge as I usually do when I make recipes and decided to add these ingredients to make this hummus a little different. I recently received some carrots through our CSA that had this wonderfully subtle sweet flavor and thought that they could give the hummus and tahini some depth in flavor. I've definitely had hummus with garlic which I love so I also decided to load up on that. Finally, lime came into the picture because I had limes and love the idea of the hummus being strong, a little sweet and a little tangy! A note on olive oil in the recipe, go with your gut! I start you off with 1/4 cup olive oil but I guarantee you that isn't enough. While blending the ingredients together I had to constantly add olive oil to get my desired consistency. After a while it was hard to calculate how much I've used so I suggest using the method I did. Start with the 1/4 cup then add little by little until the hummus and smooth and to your liking. You will also need extra for the top when serving. Salt and pepper as always should be used to your own taste. I think you can use as much paprika as you'd like too. I wouldn't use more than 1 or 2 tablespoons especially because you should have some for the top when serving, as seen in most of my photos. I really enjoyed making this hummus and the cost of the ingredients was low. It's a great choice for a party appetizer! When I was younger I used to eat noodles all the time! Not just mac 'n' cheese but my mom would make this "green sauce" which wasn't really sauce just butter and basil which was SO GOOD. Nowadays I try to eat as healthy as I can, avoiding an excess of grains and noodles, with the exception of rice. I can't live without my rice! After doing some research I kept finding "green tea" noodles but these were mostly pre-packaged noodles that were made with green tea. I decided that I wanted to infuse my noodles and although I couldn't find an exact method, I kept it really simple. I think that to make this recipe a success, you should use whatever noodle type you want. I used these flat korean noodles that I had in my shelves and they were great but I think this would work with any noodle and here's why. All you do is dump the tea into the water with the noodles and they will cook in the tea! The Berber blend from Tay Tea has Moroccan mint so it gives the noodles this fun minty flavor! I love every part of tea and when I make recipes I often leave some of the leaves in it for fun because they don't bother me. If you cook the noodles in the tea you will have noodles with pieces of tea leaves on them, I really like this but if you don't you can do it a different way. If you want tea leaf free noodles, I would brew the tea first, strain it then cook the noodles in them! Now on to toppings and sauce. This would be delicious with a number of different sauces and I encourage you to pick your own. I like to use whatever ingredients I have so I whipped up a little stir fry of garlic, onions, salt and garlic chili paste! Mix your noodles and enjoy! The minty flavor is very refreshing! I Wanted to share really quickly a book that my friend Lu-Ann over at The Cup Of Life wrote, it's filled with inspiration and I often like to read it when I'm enjoying tea! You should also check her out because she recently had me on her monthly "at the tea table" ! So there you have it, another fun and simple way to incorporate tea into your day! I want to encourage you to give Sips by a shot, not just because I partner with them but I think that their monthly boxes are seriously a great way to discover new teas if you're into that! Also, this weekend 100% of their sales will be donated to Hurricane Harvey Relief! One of my favorite things to make when I first started baking was scones! They were one of my favorite foods to have with a cup of tea! When I was trying to decide what to make with my Sips by teas, I remembered that I have never made any biscuits when enjoying tea. The sunset red from teabook was perfect because its a darker tea and has sweeter notes. I was of course excited about brewing this tea in my gaiwan! I really love the little packets they came in, perfect for one serving! I wanted my tea to be really strong so that the flavor would be present in the biscuits so I used 3 of the packets but feel free to use as much or as little tea as you like depending on how strong of a flavor you want! This is a really dry batter that makes thick but yummy biscuits! There is baking powder in the batter so these will rise even if the batter is less thick. I think it would be safe to decrease the flour a little bit to get fluffier muffins. Next time I may also either infuse the tea into milk to use in the recipe or simply add milk little by little to loosen up the batter. As far as sugar, it's up to you on how sweet you want to make these. I used only one tablespoon in mine which made these slightly more savory and using up to 4 tablespoons would make them sweet, your choice! Make sure to enjoy these sooner rather than later! I tasted these right when they came out of the oven and also later. They are good in both cases but I really liked when they were warm out of the oven. Tea infused butter! I've written about this on my blog before because it's an easy way to get tea into a recipe since most recipes include butter! All you have to do is melt the butter, throw the tea in to brew, strain and then let it cool, it will congeal. As far as brewing time, I always wait until the butter becomes fragrant. I used all sorts of delicious teas for my butter, here is the list! The tea infused butter is a fun addition and would be a great party appetizer to have the biscuits and the different butter flavors! I've probably mentioned on my blog or instagram before that I LOVE rice. It's pretty difficult not to when you grow up in a Persian household. Like tea, rice is very central to our culture. Rice is an essential ingredient in most dishes and I've always thought it was something that held together our stews. That being said, my favorite rice is definitely basmati. Basmati rice is what I grew up eating and it's my favorite to cook as well. A while ago, I got a Blue Apron meal where there was a garlic jasmine rice recipe. I don't often use jasmine rice but it was a simple and delicious recipe that I have recreated almost every time I marinate meat with Japanese inspired spices. Most times when I cook I think to myself, how can I incorporate tea into this dish? ENTER Alishan Oolong from Terroir Tea Merchant! I hear so many people talk about how cooking is so difficult and that's why they don't do it. I totally disagree, YOU ARE MISSING OUT! Unlike baking, cooking gives you a lot more room for experimentation and that is the best part. I like to share simple recipes so that anyone can try them at home. This recipe doesn't get much easier! Essentially, you are replacing the water used in the recipe to cook the rice with brewed tea. The tea cooks the rice and also infuses it with the oolong flavor. Again thanks to Sipsby I got to create a unique dish! The Alishan Oolong is described as buttery, floral and nutty. These flavors cut the garlic the perfect amount and give the rice a little more depth than when it's cooked with plain water.